Elasticsearch is an open source, distributed, REST-ful search engine. In addition to being a great search engine, it is also great for analytics, storing logs, etc. — a general “NoSQL”-store. Elastic Cloud provides dedicated Elasticsearch clusters with reserved memory and storage, ensuring predictable performance. Replication and automatic failover is provided for production and mission critical environments, protecting your cluster against unplanned downtime. Your cluster is managed by the engineers that build Elasticsearch itself. After installing Elastic Cloud, the application should be configured to fully integrate with the add-on. 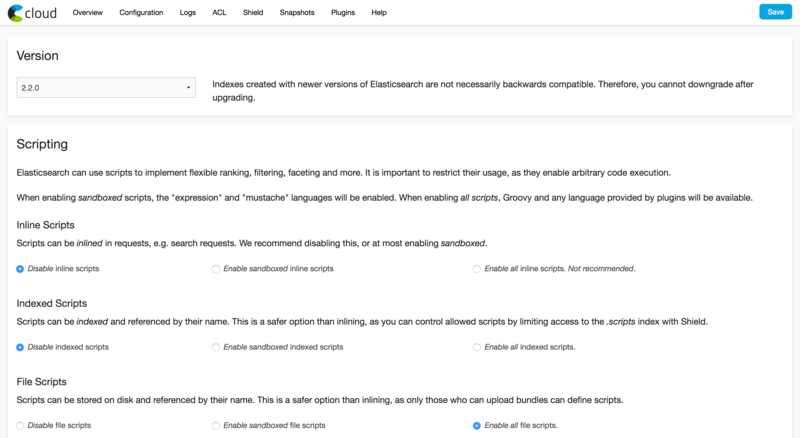 If you want a specific version of Elasticsearch, you can use the --elasticsearch-version-option, e.g. --elasticsearch-version 2.2.1. We also provide many of the plugins that are available for Elasticsearch. Use --plugins to specify a comma-separated list of plugins you want installed. For example, --plugins analysis-phonetic,analysis-kuromoji. After the addon has been added, version upgrades and plugin changes can be done through the add-on dashboard. If you need to use custom plugins, you can upload and select plugins in the add-on dashboard. We support the two most recent major versions at all times. New versions are made available for provisioning soon after they’re released. It is your choice when (not) to upgrade. We recommend keeping up with new versions, however. The Elastic Cloud dashboard allows you to manage the cluster, like upgrading versions, configuring Shield, and viewing the logs emitted from the nodes. or by visiting the Heroku Dashboard and selecting Elastic Cloud from the Add-ons menu. We strongly recommend that you configure access control with the X-Pack security features (called Shield in versions before 5.0) for your cluster. With the default configuration, since not all Elasticsearch versions before 5.0 require authentication, anyone knowing the cluster ID has full access to your cluster. We highly recommend that you become familiar with the X-Pack security features (called Shield in versions before 5.0) and configure role-based access control. To learn more, see Securing your Cluster. To rotate credentials for your cluster, first log in to the Elastic Cloud addon dashboard. Then click on “Security” or “Shield” in the top menu (depending on your cluster’s version) to reset your password and/or change users. In this section, we will briefly go through the indexing, updating, retrieving, searching and deleting documents in an Elasticsearch cluster. We will use curl as our client from the command line. In the above example, the index my_index is created dynamically when the first document is inserted into it. All documents in Elasticsearch have a type and an id, which is echoed as _type and _id in the JSON responses. If no id is specified during indexing, a random id is generated. As you can see, the document is updated and the _version counter is automatically incremented. If Elasticsearch find the document, it returns a HTTP status code of 200 OK and sets exists: true in the result. Otherwise, a HTTP status code of 404 Not Found is used and the result will contain exists: false. Note that we added ?pretty=true to the request, which makes Elasticsearch return a more human readable JSON response. Due to performance reasons, this is not recommended in production. Documents are deleted from Elasticsearch by sending HTTP DELETE requests. All Elasticsearch clients using the REST API can be used with this add-on. Also, the Java Transport client can be used. We do not support the Node client. Elasticsearch comes with a REST API, which can be used directly via any HTTP client. Elastic Cloud can be removed via the CLI. Available memory is a very important factor when sizing your Elasticsearch cluster, and replicating across multiple data centers is important for the resilience of production applications. Our plans are differentiated on the available reserved memory and disk quota, as well as on the number of data centers. Upgrading to a new plan is done by extending the existing cluster with new nodes and migrating data from the old nodes to the new nodes. When the migration is finished, the old nodes are shut down and removed from the cluster. You can search and index while this happens. Please see our support page and reach out if you have any problems. Quote the first six characters of your cluster’s ID in your post. For Heroku users, the option to reboot Elasticsearch clusters is not available in the UI. Please post in the support forum if you need us to reboot a cluster for you. Elastic Cloud exposes the majority of the Elasticsearch REST API, which means that most valid Elasticsearch API requests will work with your provisioned instance. Please refer to the Elasticsearch guide for more in-depth explanations of all the possibilities.